No one is identifying the true source of the success or failure of the existing paradigm of relationships. According to the Centers for Disease Control and Prevention (CDC), as of 2014 there were roughly 3.2 divorces and annulments for every 1,000 people in the U.S.
After he distinguished an imbalance of energies within humans, Cohen recognized the importance of tapping into both the female and male energy inside each person for growth in life and relationships. 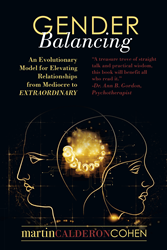 Cohen guides readers on how to observe, identify and balance these feminine and masculine energies as well as how to build on the five primary relationships to create lasting ones. Cohen uses client stories to enhance the simple concepts that can be incorporated into everyone’s daily life. For more information, visit martincohen.org. Martin Calderon Cohen is the president of Martin Cohen Consultants, Inc. For roughly 40 years, Cohen has been studying, designing and delivering leadership and relationship programs. He partners with committed individuals, empowering them to achieve high levels of success, happiness and satisfaction in their lives. Cohen has been happily married for more than 30 years and has five children.